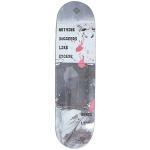 Skateboard Decks - Free Grip! Here you'll find a selection of the best skateboard deck brands in a variety of styles and sizes to suit any skateboarder. 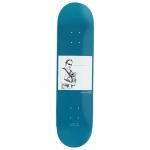 We stock a range of pro skateboard decks and team decks from US And UK skateboard brands. Choosing a deck is a great place to start if you want to build your own skateboard. All our skateboard decks come with free Jessup griptape as standard. Need some advice? Feel free to give our Manchester Store a call on 0161 747 6066 and our friendly staff will be happy to help. Enjoi Whitey Panda Logo R7 Deck - 7.75"
Enjoi Whitey Panda Logo R7 Deck - 8.0"